Difficult to tell from other local gartersnakes, this is southern Arizona’s most aquatic (lives mostly in water). They feed mainly on frogs and fish, and, unfortunately, throughout most of their range, these prey items are diminished. To further complicate the life of a Mexican gartersnake, bullfrogs readily eat their young and most sport fish are too large for them to eat. Successful efforts to reestablish native frogs and fish will surely benefit this rare species. Maybe our most commonly seen gartersnake, this snake is sometimes found far from water. Although rarely seen at Cienega Creek, it is quite abundant in many of the surrounding desert and mountain canyons. 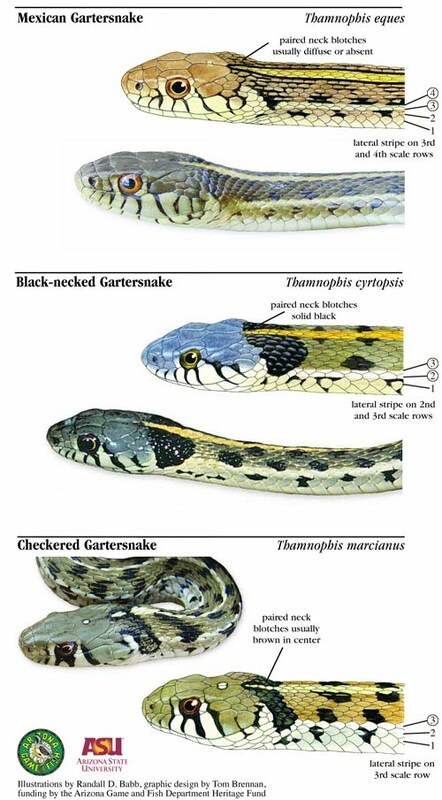 More of a generalist than the Mexican Gartersnake, this species spends more time away from permanent water feeding on lizards and small rodents as well as toad tadpoles, but it also invades perennial waters and eats frogs and fish.